Hepatitis A is a viral infection that causes inflammation of the liver and is contracted via contaminated supplies of food and water. The World Health Organization have estimated that there are approximately 1.4 million cases of hepatitis A every year worldwide. 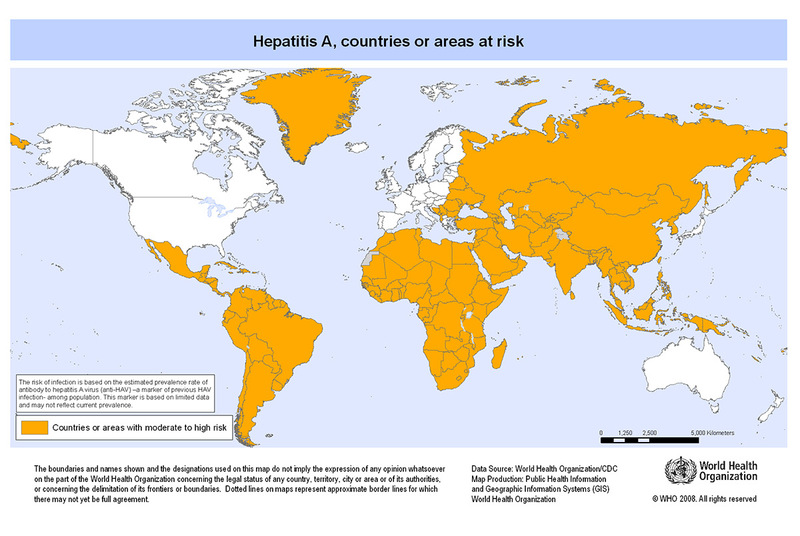 Countries at risk Hepatitis A occurs worldwide however the majority of cases occurs in developing countries with poor sanitation and hygiene commonly in Africa, Asia, South & Central America. It can take up to 14-28 days for symptoms to arise. The severity of symtoms can range from mild to severe and include fever, nausea, vomiting, diarrhoa muscle aches, weight loss, abdominal pain and yellowing of the skin and eyes. Once vaccinated with Hepatitis A a booster is required after a minimum of 6 months. Once the booster has been administered the individual will be covered against Hepatitis A for 25 years.